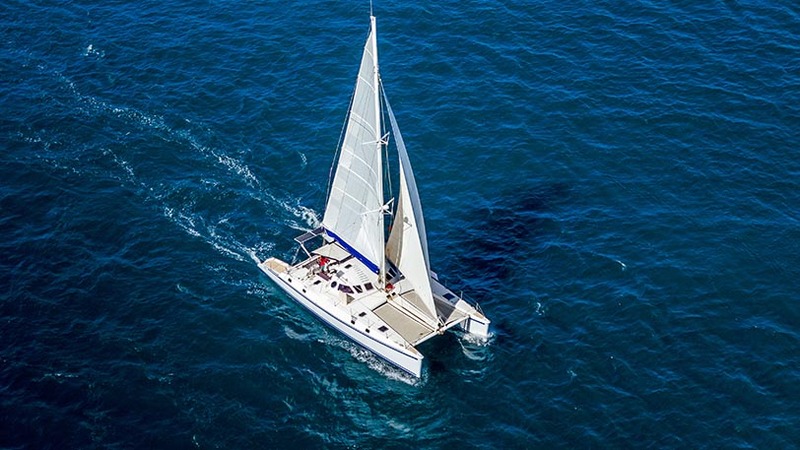 What is a sailing catamaran and how to charter one? Imagine you are sailing into a marina or a bay with a sharp looking catamaran. People will most likely start staring at you, or better said at your yacht. Because, let’s face it, catamarans really do look like something else. Not only do they look good, but they are spacious, comfortable, and they can be very fast. You could say they are successfully combining all qualities of mono and multihull sailing yachts, with slightly more emphasis put on pure joy of relaxing on the yacht and slightly less on performance. A catamaran is a type of boat consisting of two hulls joined by a frame. They can be sail- or engine-powered. Catamarans have two engines, one in each hull. To become a now popular vessel, this type of sailing boat had to survive some strong scepticism from more tradition-oriented sailors. Catamarans were "invented" by an aristocratic fishing community in the southern coast of Tamil Nadu, India. However, in terms of leisure and sport sailing, catamarans are a fairly recent fashion. Chartering a catamaran is no different than chartering any other type of yacht. Once you choose your yacht charter company, see what catamarans they offer, and pick the one that suits your needs the best. If, on the other hand, you have no experience and/or a permit, it is also possible to choose a skippered or fully crewed charter catamaran. Looking back into history, there were never as many multihulls sailing around the globe as there are today. The big leap in popularity of multihull sailing yachts is very noticeable, especially among charter companies. In other words, more and more people are recognizing the benefits and convenience of sailing on multihulls. 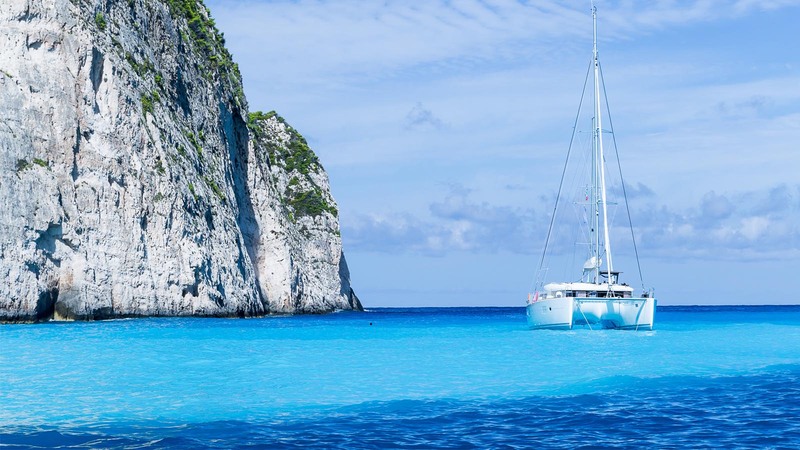 Some of the major brands or manufacturers on the market for catamarans are Lagoon, Leopard, Nautitech, Bali and Fountaine Pajot, along with a significant number of newcomers to catamaran industry. These are big catamaran makers, especially for the huge charter business. Lagoon is the overall leader in sales. This is a French company and they manufacture their boats in France. The most recognizable feature of the brand is their ability to create almost magical, large amounts of space on the yachts. The most popular charter models range from 38 feet to 56 feet in length. They also build catamarans up to 77 feet long. Lagoon is also one of the pioneers in power/motor catamaran segment of the industry. Lagoon catamarans are build with emphasis on comfort and the charter business in mind, where they can fit comfortably four or more cabins onboard for four or more couples. Nautitech is one of the largest catamaran manufacturers in the world, operating underneath the Bavaria Yachts brand. The brand is also known for their specific position of the helm, more in the style of a monohull sailing yacht. Nautitech offers a size range from 40 to 55 feet long. There are two lines of catamarans. The first is Nautitech meant for comfortable voyages, and the second one is Ocean Voyagers, day-charter catamarans for the tourist industry. There is also a Power line of only motor-propelled catamarans. 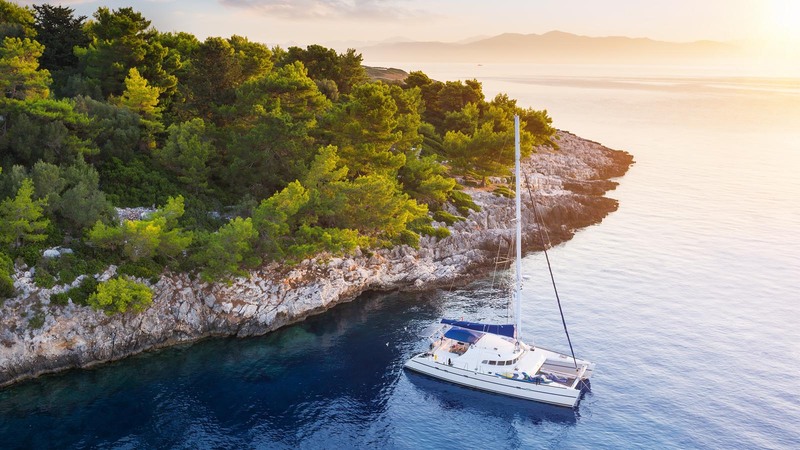 Nautitech catamarans are available for charter in the most popular sailing destinations from Greece and Croatia to the Caribbean destinations. Fountaine Pajot is another French company that has been building production cruising catamarans since 1983. Large heritage is visible through their special attention to detail and smart solutions for optimum space usage on the yacht. They offer a size range from 36 feet to 80 feet in length. This is also a hugely popular charter catamaran brand. 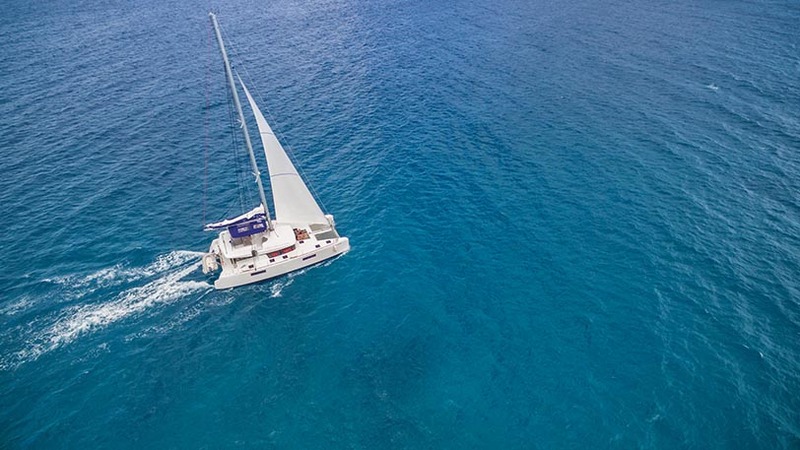 Opt for one of these most popular charter catamarans and you will have a beautiful sailing charter holidays to look forward to. There are a few multihull producers which are putting strong emphasis on sailing performances of a yachts, while still maintaining most of the qualities for which multihulls are known. A classic catamaran with very slim hulls, providing even less water resistance to the boat and enabling the boat reaching greater speeds. A very performance-oriented multihull producer, but what they are known for is their first ever production of foil catamaran Gunboat G4. The boat is literary flying over the water surface. There is a trimaran which is comfy and fast, and its name is Neel. Neel trimarans are spacious and can cruise at very high speeds alongside their good looks. The winner of award for the best full-size catamaran over the 50 feet. I want it all! I want perfection! For those who demand pure comfort perfection on board of a multihull, or want maximum security for members of their crew, there is a very convenient type of catamaran called a power catamaran which is propelled solely by engines. That could be translated into far less sailing equipment and devices on the boat, and all of us who have sailed know that there is always something from sailing equipment on the boat that can get us hurt or trip over. In case of power catamarans there are no winches, stoppers, ropes and similar equipment, making the boat much safer for the youngest crew members. For those who like to enjoy sunbathing while sailing, no worries, there are no sails to put you in a shaded position while sailing on your boat. A typical day aboard a charter catamaran is no different than a day on any of the yacht charter boats. The day normally starts with breakfast on board, usually anchored in some lovely cove or marina. After breakfast you can stay wherever your anchored, go to the shore to do some sightseeing and shopping, or enjoy the sun and the sea. Then you can raise your sails and set off to another location. While sailing a catamaran, just relax and enjoy the ride. Since catamarans are pretty stable, and there is no heel sailing, you can sunbathe, enjoy a cool drink or a delicious meal even under full sails. You do not have to be afraid the glasses will tip over and that you will make a mess since catamarans rarely heel over five degrees. If you, however, chose not to have lunch while sailing, you can find some nice quiet spot. As catamarans have a shallow draft, for lunchtime you can choose some lovely bay and anchor right in front of a beach. After lunch you can swim, sunbathe, do some water sports, or simply rest somewhere in private. Privacy is something that catamarans have a plenty of. You can find a quiet spot just for yourself to enjoy in, read a book or sleep. As the evening approaches, you can set off to the nearest marina. That is unless you are already in one. After you find a nice spot for your catamaran, all there is left for you is to decide where and how to spend the rest of the evening. There are many options: you can go sightseeing, do some grocery shopping, exploring the shore, you can also go and see what the local nightlife has to offer. Or you can simply stay on your catamaran enjoying the company of your crew.